One of several new critical thinking/technology integration curricular experiences, programmable Bee Bots are being used at Saint David's to develop problem solving/programming skills in our first graders. Today was their first session. These "bees on wheels," much like a tank, can move forward or backward and they can pivot left and right. There are buttons on their backs that are associated with these movements. There is also a Go button in the middle, and stop and pause buttons. On this day, to introduce the Bee Bots and how they work to the first graders, the teacher first played Simon Says. It was an engaging and dynamic way to get the boys up and moving and to familiarize them with the commands they would soon be using to program their Bee Bots. 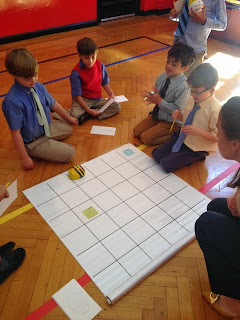 The boys learned quickly that the Bee Bot "remembers" a series of commands in sequence up until they press the GO button and then moves according to those commands. Next, the boys were shown a map that featured HOME and their destination (in this case the PARK). After being given instructions to devise a route to get from HOME to the PARK, using the movement patterns that the Bee Bot can make, the boys worked in small groups, first developing their 'routes' away from the map so they could think about programming globally, discuss different options, and come to an agreed upon route. The boys realized before long that there are several ways to solve a problem. After much discussion, debate and processing, the boys wrote down or drew their agreed upon programming code (some boys used arrows to indicate the directions, while some groups used letters) and then tested it on the map. The excitement in the small gym was palpable. 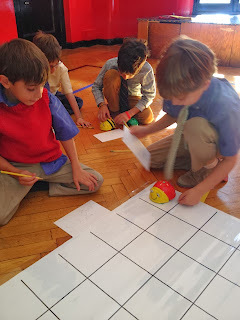 In later sessions, the teacher will add "Stop Signs" and new destinations that the boys can opt to program their Bee Bot to visit along the way, making this an open ended project that allows for differentiated learning and creative thinking. Often the teacher will end the session by having the boys move like Bee Bots according to directions posted to the wall. In doing this, the class begins and ends with a kinesthetic component, important to boys' learning. Overall, the main goal is to have the boys engage in problem solving and critical thinking exercises by discussing and testing a variety of options in solving a particular problem. Today in sports, sixth grade boys learned how diet impacts their health, affecting athletic and academic performance. Today's session, the first in a series and part of a larger interdisciplinary unit of study on nutrition, was developed by the Athletics, Food Service and Health Service departments. The day included an informative presentation led by a registered dietician from our food service company, Cater to You, who spoke to the boys about the importance of portion size, eating colorful phytonutrient-rich fruits and vegetables and whole grains, staying hydrated, and avoiding foods high in sugar and fat. 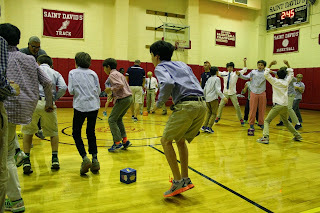 The session also had the boys up and playing in two games that reinforced the concepts taught: "Roll-n-Fit," in which boys performed exercises after rolling dice decorated with different foods; and "Build-a-Meal Basketball," which involved competing in teams to create the most healthy meals comprised of foods from each of the main food groups. 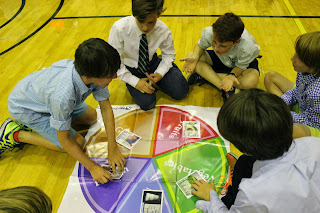 The boys clearly had fun competing in the games, while learning in a physically active way how to make smart food choices for optimal health and peak performance. This year, as we consider the theme "Critical Analysis," drawn from our mission, this new addition to our athletics curriculum builds on efforts we have been making to expand our program to incorporate healthy lifestyle choices through nutrition and fitness. Following is a letter written by Nelba Marquez-Greene and published online by Education Week on September 6, 2013. It's an important reminder of the events of that day, the heroism of teachers and the gifts our children give us. 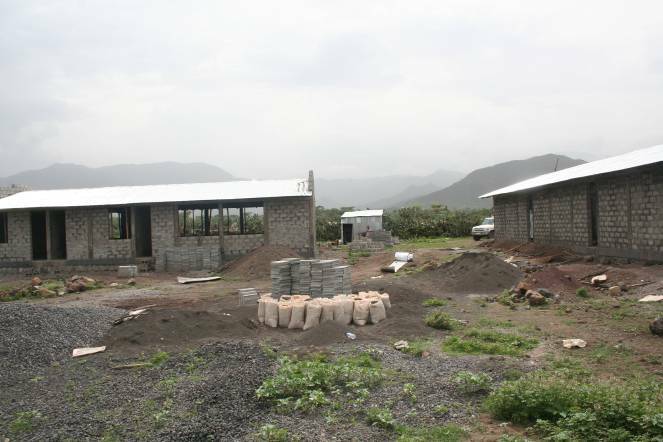 The Kalina school project funded by Saint David’s School is on the verge of completion. 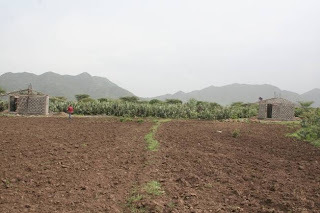 Located in one of the more remote districts of Tigray, Ethiopia, known as Raya-Azebo, The Kalina school is 120 kilometers from Mekelle, the capital of Tigray. The first primary school in Kalina, known as a dass school, served 232 children, of which 47% were girls, in the 2012/13 academic year. A dass school is an open air instructional space--no roof, no walls, no water. The dass was the beginning phases of developing a formal "school" program in Kalina in preparation for the second cycle: The Saint David's Project. 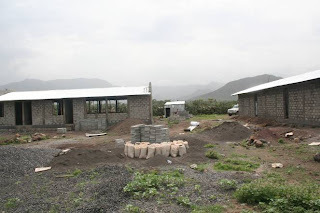 The Saint David’s funded project is comprised of one building block with four classrooms, another building block with three administrative and resource center rooms, and two additional smaller blocks of dry latrines, one for girls and one for boys. Approximately 90% of the construction work was completed as of the end of August 2013, and the Kalina children already have access to potable water. This is huge! In addition to all the benefits of a proper school, we are providing the community with the tremendous benefits of a well too. The academic year in Tigray is scheduled to begin in late September. Kalina in on track to be ready for that day! Late in the summer, former Student Council President, Colin J., '11, of his own volition, reached out to some of his nearby Saint David's friends in the Hamptons and organized a special fundraiser for the school's efforts in Ethiopia--efforts he himself had helped initiate more than three years ago. 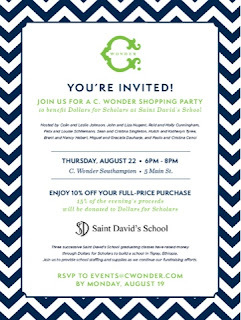 The event took place Thursday evening, August 22nd at C-Wonder. 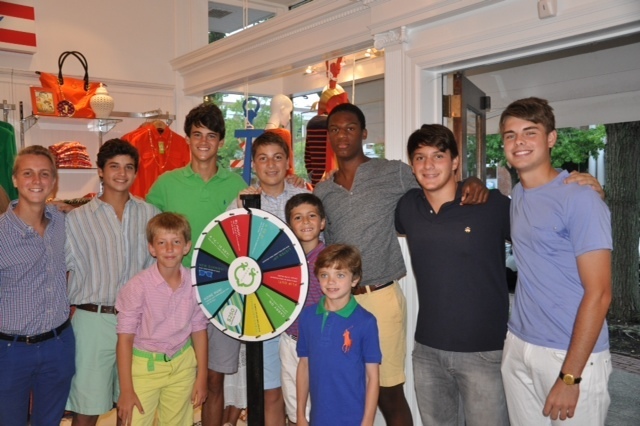 75-85 people attended the event where each family enjoyed 10% off their purchases. In addition, Colin had negotiated with C-Wonder that an additional 15% of the entire night's sales would be donated to the Saint David's Dollars for Ethiopia Scholars initiative. Festive refreshments in the store included "hint" water and cupcakes with sprinkles donated with the Saint David's logo on them. On the night, the store sold over $7,000 worth of goods, and two generous families decided to match the amount raised for the initiative, bringing the total raised by the boys that night to more than $4,000. "Equally as important as the money," Colin suggested, "was that the event raised awareness about a project Saint David's has been working on for the past four years." The best part of the evening, Colin told me, "... was having the opportunity to catch up with Saint David's boys from all ages. Our love and spirit for the school has clearly not diminished!" We couldn't agree more, Colin, or be more proud of you, your friends and your collective efforts--Saint David's boys contributing to the greater good, on their own! Does it get any better than this? 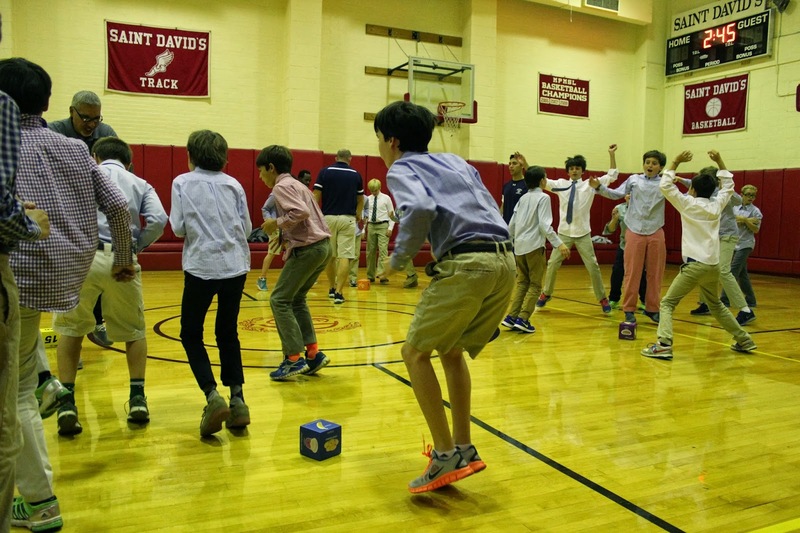 The total raised by Saint David's boys over the last four years now amounts to more than $127,000; construction continues apace in Ethiopia.